Columbia Md — It’s not an MIAA A Conference championship for the McDonogh boy’s lacrosse team, but the Eagles were impressive in capturing their second-straight National High School Lacrosse Showcase (NHSLS) title. The Eagles dominated both halves, Sunday in Columbia, defeating MIAA rival, Calvert Hall, 8-4, in the championship game. Rising junior attack Jack Parr lead the Eagles with three goals and Mike Shinsky had a pair of goals in the victory. The defense for McDonogh was also outstanding from start to finish. 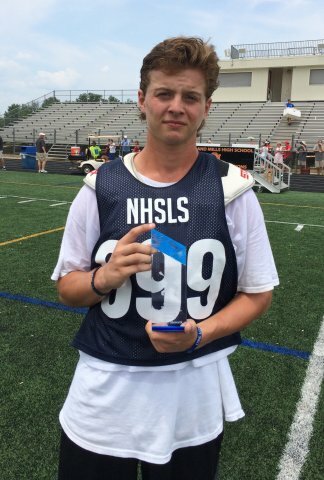 Penn State recruit Barrett Sutley scored a goal and an assist to help McDonogh defeat Calvert Hall 8-4 in the NHSLS championship game. Calvert Hall started the day by upsetting Haverford (PA) in the semifinals, 6-2. The Cardinals reached the final with nice back-to-back wins, in a short amount of time, topping Culver Academy (IN) on Saturday night and then the Fords on Sunday morning. On his squad’s victory over Haverford, the nation’s top-ranked team last season, Kelly added. McDonogh battled St. Paul’s to an overtime victory in their semifinal game. Sutley, who enters the 2016 season as the team leader, spoke about getting a taste of that leadership this weekend. Attackman Jack Kinnear scored twice for Calvert Hall in the loss to McDonogh. Boys’ Latin defeated Highland Park (TX), 11-5; Gilman topped Fairport (NY), 7-6; and John Carroll defeated St Albans (VA), 6-3.